You may have noticed, we’ve been talking about “national days” lately. There are national days for triglycerides, black forest cake, something on a stick, and even weed appreciation has a national day. These national days make us smile and remind us to appreciate the small stuff, but today, March 29, is National Mom and Pop Business Owners Day. 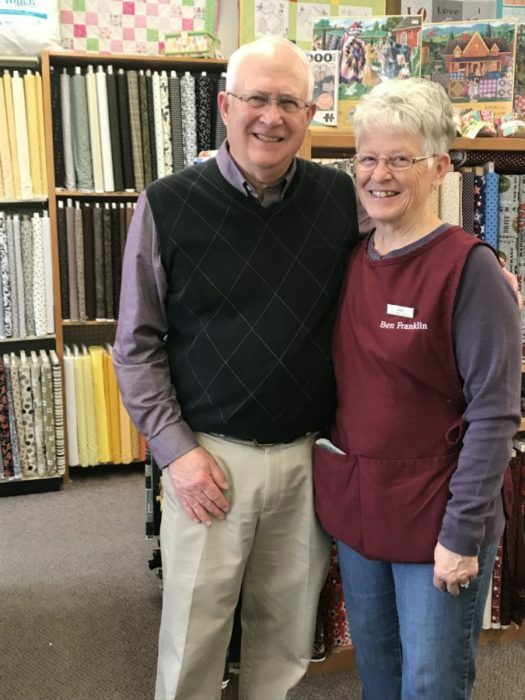 Many of our businesses here in Winterset would qualify as a “Mom & Pop Business” but the people that came to mind first for us were Dave and Judy Trask, owners of the local Ben Franklin store. 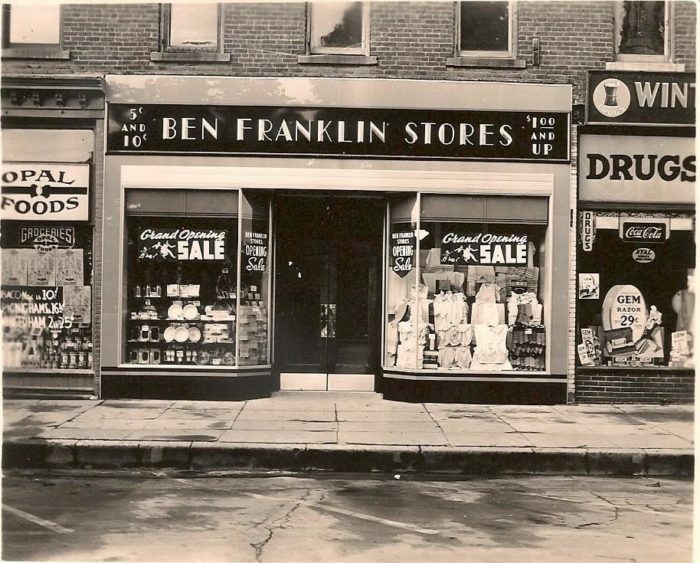 Recently we stopped by the store to talk with Dave & Judy about owning a Ben Franklin store. It was mid-afternoon, the store was bustling, and as we talked with them, we kept repositioning ourselves to get out of the way of the shoppers. (They were especially interested in the fabric!) The longer we talked with the Trasks, the more evident it became just how much Dave and Judy love their store and our community. It’s really quite infectious! After getting out of the Army, Dave went to work at S.S. Kresge Co., the forerunner of KMart stores, and he and the other managers would be at a store for a few months to a year and then they would be transferred. After working at 4 different stores in 4 years (and having to move each time), Dave and Judy decided that was no way to raise their young family and so they began thinking about the possibility of owning their own store. We think Dave had a little luck on his side and managed to be in the right place at the right moment. He caught wind that the current owner of the Winterset Ben Franklin was thinking of selling, and purchased the store on a handshake that same day. It took another year to get the details in place but by 1978 they owned the store. The first thing they did was purchase the building next to them and knock out a few sections of wall to increase the size of their store. The fabric area was enlarged and filled with the current fabrics of the time, which included a lot of fake fur and polyester double knits. Oh we wish we could have seen it!! Both Dave and Judy grew up in Winterset and when we asked whether they were high school sweethearts it was easy to see that they are a good match. Dave said “yes” but Judy was a little more hesitant. Then they laughed and shrugged off the difference of opinion. Judy attended ‘country school’ and their paths did not cross until 8th grade. Dave recalls seeing Judy during summer band, “… she played a silver saxophone and with that blonde ponytail I started to notice HER”. When asked if it was difficult to work together every day they laughed and smiled and told us that they get asked that a lot but it doesn’t bother them. Dave said, “She runs the store, and I run the business AND we have a wonderful staff of employees.” They’ve obviously figured out how to work as a good team. In 80 years of existence, this store has only been owned by two families. In today’s “change by the minute” world, that’s just amazing. According to Dave, the biggest change in the retail industry in the past 41 years is the rise of shopping malls and discount stores. They just didn’t exist in 1978. We’re certain Dave could have talked about the fax machine or the computer coming into the retail world, but he’s a big picture guy and the malls and discount store must have caused a major change in the business model. Those other things are just the tools that get the job done. They see the biggest change in Winterset as being the rise of tourism…and Dave & Judy have had their hands in that as well. Dave was part of getting the John Wayne Birthplace house purchased and turned into an attraction and they were both extras in the Bridges of Madison County movie. Look for them during the scene filmed at the Northside Café. And during the summer months, you’ll see them nearly every morning watering our beautiful hanging baskets. They were part of the team behind that initiative several years ago as well. According to the Trasks, one of the best things about owning the store for 41 years is the sense of belonging and the relationships they’ve formed in the community. Many people come in the store and ask Judy for advice on lots of issues, but mostly quilting. Judy says that often during the Christmas season folks will bring in a plate of cookies for the Trasks and their employees. She says we are more than just customers. 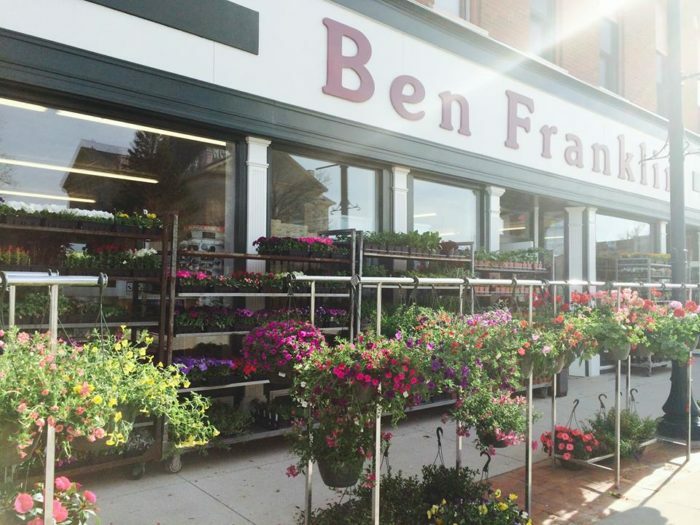 Our Ben Franklin has just about everything you could need, from model cars and puzzles to fabric & gifts, make-up & umbrellas to tools & dishes. Every year they even have a large selection of annual flowers for sale out front. Look for this year’s batch to arrive about April 25th. Stop by and say hi to Dave & Judy at one of our very own Mom & Pop businesses, the Ben Franklin store! Or you can do that via social media, with the hashtag #MomPopBusinessOwnersDay. If you’d like to learn more about our Ben Franklin store, find them on the south side of the square and on Facebook, too.